Completing Mattel's Collect-N-Connect Bat Signal was not an enjoyable experience. Logic dictates that BAF + shortpacked figures = massive retail headaches. Released in two waves, Mattel's Dark Knight Rises Movie Masters figures were a pain to collect, at least if you were looking for a full set, and of course with such a desirable BAF most people wanted every figure. In the first wave, it was Alfred who was the hardest to track down, but the entire second wave was a pretty huge debacle. Since most stores were still drowning in Batman and Bane figures, it was some time before the Ra's Al-Ghul, GCPD John Blake and Catwoman ever made it to pegs in significant numbers. They were never as plentiful as the first wave, and if you were looking to get the exclusive Jim Gordon to give your Bat Signal a broken spotlight, you pretty much had to live at Walmart. Through a patented process I call "endlessly reloading Walmart.com and Amazon.com", I eventually scored the second wave of figures for normal, retail prices. Why is it just getting reviewed now? Well the short answer is "laziness" but the long answer, if I had to hazard a guess, would probably have to do with the bad taste left after jumping through so many hoops to complete my Bat Signal. 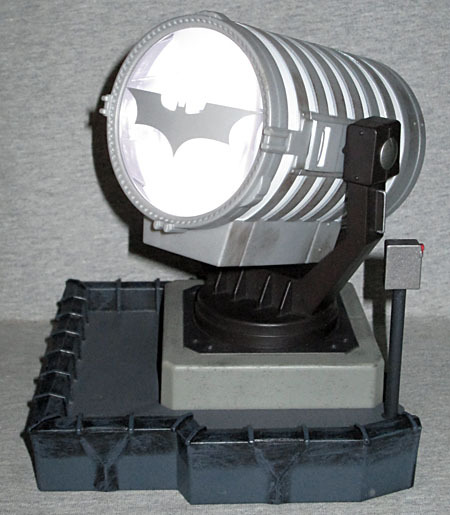 The Signal itself comes in six pieces: a corner of the roof of the Gotham City Police Department with a fuse box on a pole that plugs into the roof, a base, a cradle for the light housing, the lens, the main light housing, and the rear part of the housing (where the batteries and actual bulb are held). 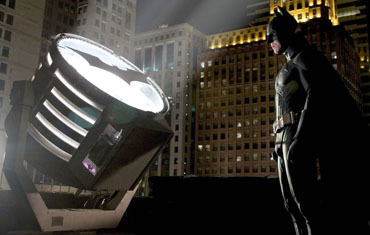 Once assembled, it does a decent job of replicating the signal from the film, though the cylindrical shape has been elongated to incorporate all the necessary elements to replicate an actual working signal at this scale. 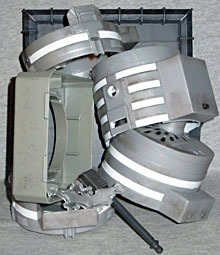 The toy signal features the "ribbed" look of the lamp housing from the films, but instead of having five slats, the toy version has eight. There's a screw-on lid on the rear housing for the battery compartment, with sculpted holes on it that I'm assuming allow some of the heat to vent from the housing of the actual lamp. 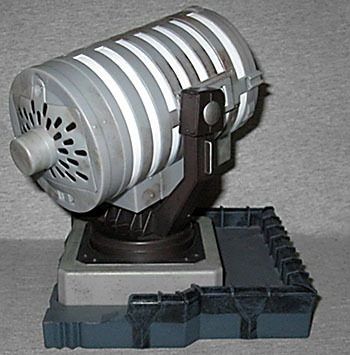 In the film, the "ribs" of the signal were transparent and allowed light to show through when the lamp was turned on; on the toy, they're painted white. The rest of the housing is molded in gray plastic with a smattering of brown to dirty it up. The sculpted holes on the battery compartment lid are painted black. The cradle is a darker gray, and the base is the same gray as the housing. The roof features two tones of gray, both of them dark. The darker edge of the roof has a wash to make it look weathered, and the switch is gunmetal with a tiny red light, on a dark gray pole. The overall paint is clean, if toyish, and the clear plastic lens features a very clean Batman logo painted on it in flat silver. 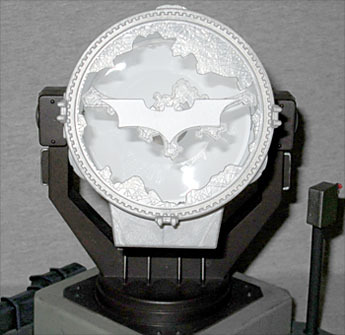 If you managed to get Gordon, you get an alternate front piece featuring a shattered lens, with a separate sculpted Batman logo piece that can either lay in the housing or be balanced precariously between the jagged edges of the lens. The Bat Signal swivels at the base of the cradle, and where the cradle meets the housing it's hinged to allow it to angle up or down. In order to switch the signal on, you turn the switch on the rear of the housing to "|" and angle the housing down until it clicks. Moving the switch to "O" will turn the light off (alternately, it turns itself off after 30 seconds, until you press the button again). The light is pretty strong, and the bat design is clear and crisp even when I point it toward my ceiling, especially if there's adequate ambient darkness. 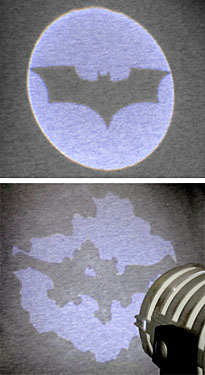 This isn't the first working Bat Signal Mattel has attempted, but it's marginally easier to get a hold of than the first one. 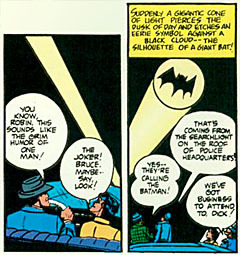 That one was was included with the "Bat-Signal Batman" in the tail end of Mattel's 6" Batman line (the one that was a precursor to DC Superheroes), in a series that was never released at all in the US. That one was tiny, though, and hardly compares to this one in terms of serving as a centerpiece of a Batman figure display. 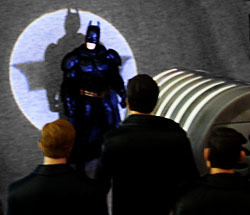 The idea of a BAF working Bat Signal was great, but being that Mattel was at the helm, there was obviously a catch. The second wave of figures (Blake, Ra's and Catwoman) eventually became plentiful enough to drive the secondary market prices into something resembling reasonable, but there never was a second run of Alfreds, so he and the exclusive Gordon still require some serious coin to obtain. Build-A-Figures are only a fun idea if the actual pieces are reasonably obtainable; otherwise you're only likely to end up with some seriously disgruntled customers (not that that's anything unfamiliar to Mattel). I get that Mattel wanted kids to be able to find a Batman and Bane on pegs, but that doesn't make sense when you're trying to justify Movie Masters as an "Adult Collector" line worthy of a premium price. It makes sense for the Gordon variant to be more limited, but when only two of your six-figure BAF series ever show up in powerful numbers, you're doing it wrong.